Everyone who knows me well knows how much I love to do family history. Last summer I ran a family reunion for my mothers side. It wasn't as well attended as I thought it should be but I take full responsibility for not having planned out anything that seemed appealing to all the different age groups. The more I do these kinds of family events, the better I become at planning and executing activities on a large scale. My mother has 9 siblings that are still alive. There were 17 altogether. Seems like the only people that make families that large are featured on TLC, as anomaly's. From the 9 siblings, each have at least 4 kids. Most have more than 6. We are a typical Polynesian family, in size. The story of how such a large family came to be is quite interesting to me and is the driving force behind my love for family history/ genealogy. A small sampling of my mothers side during our reunion in July '08. I thoroughly admire my mother's mother and didn't appreciate her enough while she walked the earth. Oh how I wish I could speak to her again and extract from her all the knowledge she possessed in regards to natural healing. She had to make hard decisions for her family. After bearing 15 children, my grandfather was murdered and she was left alone to tend to all the children. Soon after, she remarried a Tongan man and bore two more children. He was eventually deported and once again, my grandmother was left alone. She allowed three of her children to be adopted by American missionaries. I'm glad to say that we are in touch with all of them. In fact, one of the daughters that was adopted out became the sole caretaker for my grandmother until she passed from complications from a stroke. The stories are endless and I am dedicated to telling it for future posterity by way of a book. Right now I'm in the throws of planning a family reunion on my fathers side. For me, getting the family history together is the best part of the planning process. My fathers mother was also left a single mother, as she was widowed when tubercolosis took the life of my grandfather. She bore seven children. I'm sure it would have been more, had by grandfather survived his illness. This is the first flier I designed for the reunion. The images are actual ancestors. My grandmother in the top left. Her husband, my grandfather on the bottom left. The couple to the far right are my grandmothers parents. What is interesting about that couple is that he is listed on the U.S. census as being Black, however he is 100% Hawaiian. The last two people are my grandmothers grandparents, parents to the woman of the couple to the far right. 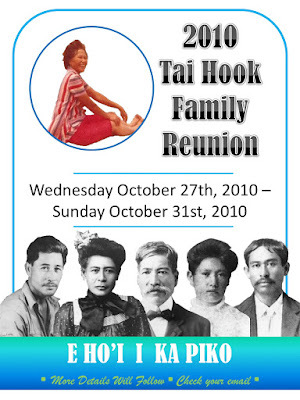 I selected, as the theme of the reunion, e ho'i i ka piko. There is no appropriate English translation. The English language is limited in it's explanation of olelo Hawai'i. The closest translation that I was able to gather from different olelo Hawai'i experts is that e ho'i ka piko means to return to the source of your existence; to return to your ancestors, to your roots; to return to your center. I find it appropriate that our first reunion be centered around us returning "home". I'm the second to the youngest grandchild and am the first to actually sit down and plan a reunion. Somebody has to do it. My husband has caught the bug and has started drumming up interest for his family to get a reunion going as well. Good luck to me that I may carry out this family reunion to fruition and that I may continue on my path of researching my family history. 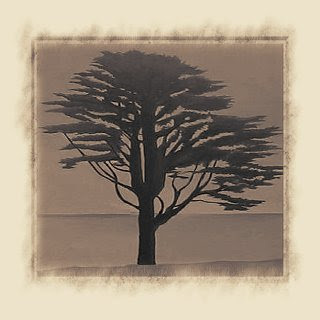 Genealogy tips are greatly appreciated! i'm so loving the poster...amazing pics!!!! good luck w the reunion, looking forward to following along your reunion journey. you can do it girl. i'm heading home for one of my reunions. i am chairing this one and co-chaired last one 3 yrs ago. Forever in a reunion committee..AAAHH!! FUN...STRESSSS..but still FUN! Delegate when you can, and remember.. don't jam pack every minute w/activities. More often than not, people just want to gather and talk story. Good luck to you. I hear ya when you say someone has to do it. You are so that one! Let me know if you need any tips. I'm helping a friend plan her fam reunion for this fall.